The European nightjar Caprimulgus europaeus provides a fine example of cryptic, or protective, coloration. Many animals have adapted their coloration as a means of defense against predators. Except where selection favors bright coloration for breeding or territorial display, most higher animals are colored in such a way that they blend in with their backgrounds – by pure coloration, by disruption of outline with bold lines or patches, or by a combination of the two. 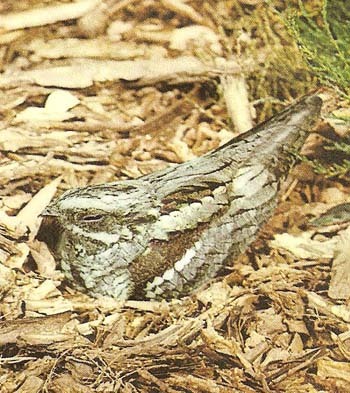 The most highly developed camouflage is found in ground-nesting birds, for example nightjars, or insects, such as walking sticks or leaf insects. Associated with this coloration must be special behavior patterns enabling the animal to "freeze" against it. Certain animals can change the body texture and coloration to match different backgrounds: octopuses, cuttlefish, chameleons, and some flatfishes. An alternative strategy adapted by some animals, particularly some insects, is shock-coloration. When approached by a predator these insects flick open dowdy wings to expose bright colors, often in the form of staring "eyes," to scare the would-be attacker.